Doc White has made a living doing pretty much exactly what he’s always wanted. To say that it’s been an exciting, fun adventure is somewhat of an understatement. From his time in the Navy during the Vietnam War to operating a charter dive company out of San Diego to traveling the world as a marine photographer, White’s love for the ocean, animals, and photography has taken him to the far reaches of the globe. Born in Raleigh, North Carolina on Christmas Day 1946, he was infected with a love for the water at an early age. The Outer Banks of North Carolina were his backyard. It was an idyllic childhood of sailing, exploring, and developing a foundation on which the rest of his life would rest. White attended the University of North Carolina and enrolled in the NROTC program there. In 1968, he graduated with a degree in business. White was commissioned in the Navy upon graduation and entered UDT/SEAL training. A knee injury ended his candidacy for Special Warfare and he was assigned to patrol craft fast, or swift boat. At 21 years old he was skippering his own boat in a free-fire zone in the Mekong Delta and on the Cambodia-Vietnam border. In a lot of ways, it was the Wild West. 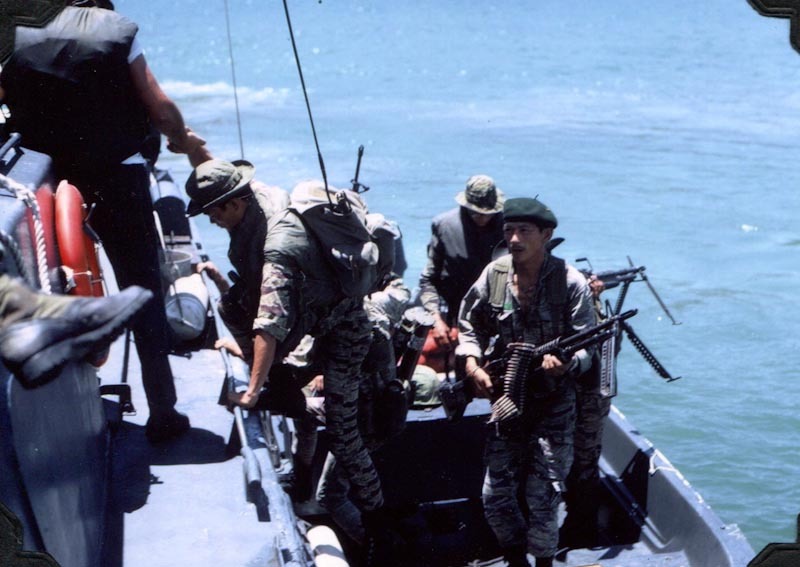 White and his men were young and tough, they often played host to SEALs, CIA operatives, mercenaries, and an array of Special Operations personnel. Running up and down the river and in the Gulf of Siam, White was wounded three times by shrapnel. In all he received two Bronze Stars for valor, the Purple Heart, the Cross of Gallantry and the Navy Commendation Medal for Valor. Back in the states, he taught guerilla and counter-guerilla warfare and counter-insurgency warfare for Special Operations in Coronado, California before being decommissioned. He spent the next year sailing and eventually decided the rejoin the Navy to fly. White flew F4 Phantoms and was assigned to the aircraft carrier USS Ranger. All in all, it was a fairly uneventful cruise—save for losing his radio and electronics at night in the middle of the Indian Ocean during a heavy rain, which made the carrier landing tricky. “But that’s what we were trained to do,” he says. He went on to fly as an adversary in VF126, often working with Naval Fighter Weapons School, or Topgun, before retiring from the Navy in 1979. After a brief stint as a pilot for Continental Airlines, the rest of White’s life began. White secured a grant from the National Geographic Society and with a crew of scientists from the University of California, Santa Cruz began an era of marine exploration that continues to this day. He traveled to the Galapagos Islands for three and a half months, helped ABC with a film on blue whales, and worked with the BBC and PBS in the Sea of Cortez. He worked out of Costa Rica for three years, and he worked in Alaska on a TV series called Nature. White and his wife, Ceci, found an untouched Japanese mini-submarine, three-man tanks lost at sea, and even looked for giant squid off the coast of New Zealand. He and his wife led a life at sea, moving between islands and coasts as the two pleased. He eventually sold the Mystique in New Zealand and spent the next seven summers photographing in the Arctic. Although his exploits have taken him around the world, White’s most famous image came from home, in the Coronado Islands off the coast of Southern California in 1988. The image, which is of a blue whale eating krill, has been voted one of the best 25 underwater images ever taken. White has since refitted an old salmon trawler for dive and photography work, named Maghia, and has worked with countless film crews and marine biologists. He’s never let the dust settle around him on land and has maintained a life of high-seas travel and adventure. Which begs the question for the rest of us, How does one make such a life of freedom? As an inspiration, White points to Richard Armitage, who later became Colin Powell’s Undersecretary of State. 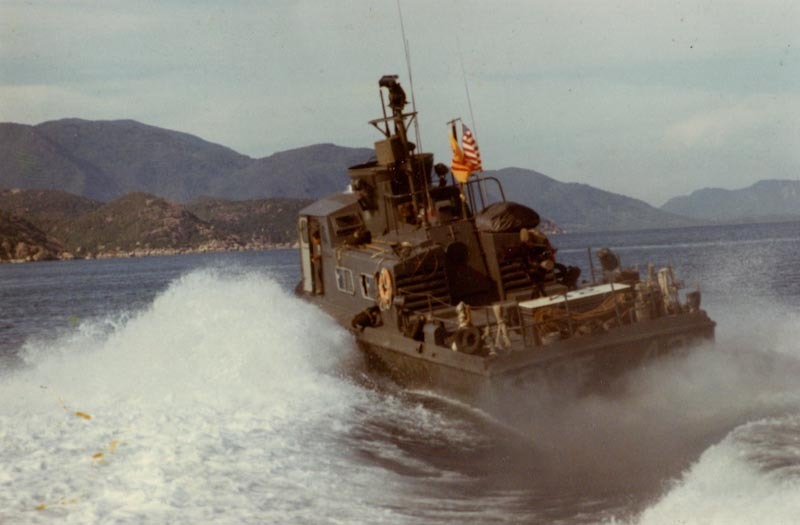 After the Vietnam War, Armitage ended up with an “armada” of civilian boats in Vietnam and was responsible for rescuing about 30,000 South Vietnamese. And that’s how White has helped himself to a life at sea. There’s nothing else he rather do—or he’d be doing it—and he’s consistently found a way to value the life he’s chosen. Whether it’s photography or writing or traveling, White says the only way to go about it is to just do it. And once you do, others will likely want to be a part of it. All images courtesy of Doc White, © Ocean Magic Photography, Doc White.